Once inside, Maestro Dudamel’s conducting of Mahler Symphony No. 1 was clear and powerful, lush and filled with inner life. As it progressed the music grew out of itself, organically, in a constant journey, an exploration leading to triumph. The youthful bravado of an early work by Mahler well-suited 26 year old Dudamel. And our orchestra clearly enjoyed the romp. Last night’s horns would have melted you. The percussion beat against your heart. Our strings sailed along with the winds. So why can’t the CSO find a Music Director? For how long will this great orchestra be able to sustain its prominence? L.A. didn’t thrash about waiting for a successor to Esa-Pekka Salonen. This hot young winderkind jumped at the chance. But if the plan is for him to one day succeed Sir Simon Rattle in Berlin, well, in retrospect, last night’s Mahler was so hot that parts of it were nearly tropical! I wonder what the Central Europeans would think of that. But we get ahead of ourselves. Berlin would be years away. I know I’ll enjoy watching Dudamel mature along the way. 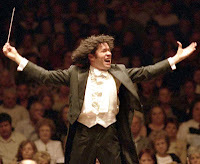 In Chicago, during the long and loud applause, Dudamel pulled a kind-of “Roberto Begnini at the Oscars” celebration. He bounded into the orchestra, embraced his soloists, one after the other, so happy for them, so bonded to them, so proud of what man can accomplish ensemble. He joyfully raised both fists triumphantly in the air. If anyone there would have dared to utter, the oft-heard lament “classical music is dying” – you would not have been able to hear it or believe it. and a delightful/insightful audio interview (recorded pre L.A. announcement) here. Ambition, muses and Olympic games. The hot 26 year old Venezuelan conductor believes he’ll find happiness in L.A. Meanwhile the Chicago Symphony Orchestra is still looking for a music director since Daniel Barenboim stepped down ten months ago. Critic Andrew Patner, in this passionate and well-reasoned article and review of Dudamel’s debut last Thursday with the Chicago Symphony, wanted the CSO to go after the Venezuelan. Well, either they didn’t take the caps off their pens fast enough, or they weren’t interested, or, once again in the arts, L.A. beat Chicago. They took the film industry away from us years ago, then the title of “second city;” is their orchestra going to eclipse ours? In architecture, leaders who 100 years ago would have probably lived in “wild west Chicago” today live and work in the exciting and still-defining-itself city of the angels. 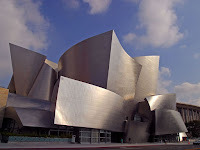 the new and fabulous Disney Hall designed by Frank Gehry. Chicago’s Symphony Center, (Daniel H. Burnham, 1904), a place many of us put up with to hear great music, but don’t love. Chicago needs to be more ambitious to stay near the top in culture. We need to realize more projects like Millennium Park (with its own fantastic Gehry-designed outdoor music venue.) I wish that rather than renovate Orchestra Hall as the CSO did a few years ago, we’d have built a new one. L.A. is ambitious today, competing with New York, the way Chicago was in the very late 1800’s, when Chicago built Adler and Sullivan’s Auditorium Theater. And speaking of L.A. and ambition, in a week we’ll find out which US city gets to compete worldwide for the Olympics. The USOC officials were taken to Chicago’s very ambitious Millennium Park, and all around town. On Saturday they’ll let us know how impressed they were. Chicago is competing against — Los Angeles. You are currently browsing the archives for the CSO category.